Are you a sucker for new techie toys like I am? I was at the Apple store the other day and decided to buy a Bluetooth Headset (and paid $37 more than I can get it for at that link!!! I'm thinking of returning that one…) Anyway, I can talk on my phone OR listen to music through that thing up to 25′ from my phone, it's so convenient and no more cords! Sorry if I'm boring some of you, but guess what else I got this weekend? I switched to a cell phone plan that includes tethering to my iPhone, so wherever I am I can get wifi on my computer! It's only $20 if you use it all month, but you can turn it off and on if you know you won't be using it! Can you tell by the overuse of exclamation points in this paragraph that I'm a little excited about this? 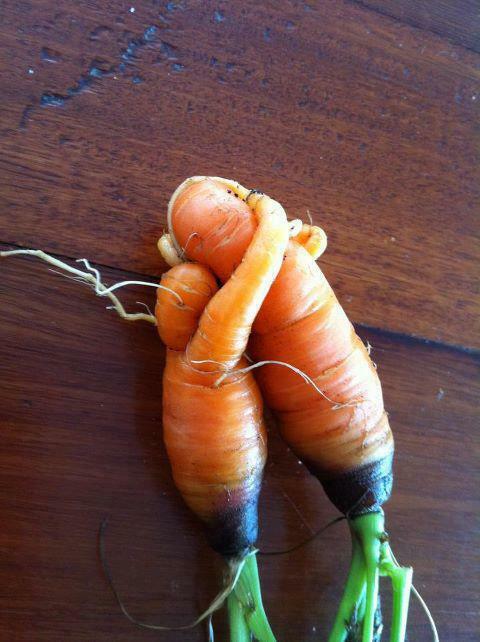 Don't you love this “carrot hugs” picture that I found somewhere on Facebook? So cute!! One of the sponsors from this great company is involved in something called, The Real Fork Project — for those of you in the San Francisco area, go check it out! My favorite Stainless Steel Round Classic Electric Pan is back in stock! 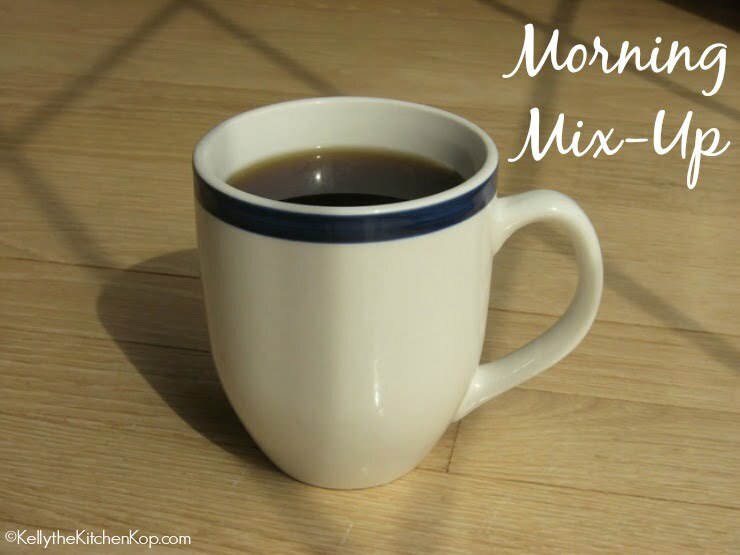 (Both 12″ or 16″ are available, but I love my great big 16″ – here's more about when we got rid of our old Teflon pan.) Recently a fluky thing happened to my pan and a prong burned out, so the company sent me a new one even though I'd had this one over a year. Pretty great customer service, huh? Thank you Colleen who sent me a link to this article, 6 Farmer's Market Scams. There's one that I was unsure about, and maybe some of you can shed some light on it, it's regarding this myth: “Farmers aren’t certified organic because it’s “too expensive.” Fact: If your grower says he or she grows organic produce but is avoiding organic certification because of the cost, take that excuse with a grain of salt. “I find that particular argument to be very frustrating,” says Franczyk. “The smallest growers are exempt from certification under the National Organic Program.” Beyond that, growers who gross between $5,001 and $20,000 a year generally only pay about $100 a year when it’s all said and done because the federally subsidized program refunds up to three-quarters of the cost. “That is pretty cheap for putting a trained third-party inspector on farm every year,” says Franczyk. Again, some farmers may be truly organic but opt out of the certification program. But you’ll want to ask more questions to be sure that they’re not talking the talk without walking the walk. Just before this post went up, Sharon sent an update to the story: Judge Allows Girl with Brain Tumor to Return to Family. But she still has to be in their research program… Takes your breath away doesn't it? On another subject — I reluctantly agreed to get rid of our landline a couple years ago, and frankly I have not missed it at all. Everyone in our family has a cell phone, so it’s not really an issue. I’ll have to check out that link but from what I’ve read, Bluetooths are actually safer than having a cell phone to your head. So do you just use a corded landline at home then? Kelly, although having one telephone seems convenient, I highly recommend researching the dangers of cellphone use. It is well-documented that the close proximity to the head can cause tumors. Not to mention EMF’s, far too many people do not know about the ill-effects of them, even to pets. I agree with the other commenter about hating all the dropped calls, missing words when in transit, background noise, and poor sound quality in general when talking to someone on a cell phone. Ugh! We bought a thing called Ooma which hooks up to your cable modem – it isn’t complicated – just plugs in. If your internet goes out, the phone does too, but that has happened maybe twice in the 2 years we have had it because our cable is buried. We tested it for a while before getting rid of our land line and could tell no difference between land and Ooma. I think it cost about $130 (we bought a refurbished one on Woot) and we paid $40 to import our old land line number. I am completely satisfied with it with our cell phones as back up. Our land line was almost $40/month with all of the taxes, even though we bundled with cable and internet, so the savings quickly add up. One of my sons has no landline, so I never call him because I do not know if he will be at work or on the road. He got rid of the landline when he was a bachelor and away on business and would come home to hundreds of messages, most of them junk calls. We live in tornado alley and I like that our phone is still up when the electricity is out. Also, we are senior citizens and I like that 911 can trace us. Our land line comes with our internet and cable TV. I do not trust the radiation from cell phones anyway. One of the best things about a wired phone is that you know where it IS. It doesn’t get left in the car, in a robe pocket, or get lost in a big purse. It is not dependent on batteries. In the cars, I have OnStar personal calling. I don’t really even need a cell phone and don’t always carry mine. Do people not want to get AWAY from phones anymore? I just hate having to call people who have nothing but a mobile. For most of these people, I have to put up with mediocre sound quality because they either have crappy phones with poor microphones, or the signal is poor because they have only one, maybe two, cell towers to work from in their area, and both of them are toward the bottom for signal strength. If people are in-transit when anyone calls, poor reception and dropped calls are the norm because of the distances between cell towers. The cost of organic certification is more than just the fee. It’s also the cost to constantly keep up with the ever changing guidelines some of which are completely useless. The link to that article is not working so I haven’t read it yet. Maybe they addressed that aspect already. I fixed the link, thanks for telling me! I would suggest keeping your landline. I work in a call centre and see too many problems/too many things go wrong with a mobile. Handsets die, signal cuts out, batteries die, mobiles get stolen etc. I don’t know about the US but here in the UK we have some prefix codes that are ALWAYS expensive called from a mobile, but that are either free or the cost is limited when dialled from a landline. We almost never use our landline, only immediate family have the number, but I wouldn’t do without unless it was costing us a lot to keep it. Kelly, we actually added a line to cell phone plan ($10 per month) and transferred our land line number. We bought some gizmo for $100 and all our existing cordless phones work. So it’s looks and feels like a landline, costs less than previously, but it’s actually cellular. We still have babysitters, some who do not have cell phones, and I don’t feel comfortable leaving without having a way to contact home or vice versa. We’ve been without landlines for 4 years now. We have never had any trouble. I prefer things this way. The only downside I see is that when we have a sitter, we have to leave one of our cell’s with her. But honestly, who cares? That has never been a problem either. 1- Least likely to go out in a storm. 2- Emergency services can find you faster. 3- They still have to have a court order to tap your landline. Anything wireless they grab automatically as per Federal law from 2005- cell, laptop, smartphone, blackberry, IPod, doesn’t matter. If you don’t mind them knowing about your great-aunt’s psoriasis, no problem. I haven’t had a landline in over 5 years and I haven’t missed it at all. There is still a land line in my house and next place I anticipate having one as well. Would only do the basics since I use the mobile for most calls but something about being certain to have a way to make local calls is comforting to me. I”m actually hoping we can budget back IN a landline. Our internet service is iffy and our Magic Jack doesn’t give good reception. Sometimes our cell signal is low at home. We’re in tornado alley so I would really like a landline (and in my dream world a ham radio and generator). I wish we could get rid of our landline – 99% of the calls coming in are telemarketing or political calls. But it’s tied to the alarm system so it stays. Isn’t there an issue with cell phones and emergency responders? Seems there used to be, but maybe technology has gone far enough to fix that. I’m on my second BT headset, an LG electronics stereo one. I use it mostly for listening to music or podcasts. But I can answer calls, too, which I never was able to figure out with the first one. As you may have figured, I don’t talk much on the phone, lol. Not sure on the cell phone thing. I am still concerned about the radiation. I have xzubis on my cell and on my landline and even want to go to a better, lower radiation landline. So I’m not sure. I do need to look into better pricing. I have had landline phones go out in storms–whether they do or not simply depends on whether the lines are buried or on poles. We’ve moved several (read WAY too many!) times in the past 6 years. Along the way, we went cell only, except when we lived in the place where there was no reception. If you have good reception, and a comfortable way to talk on your cell–I have a telephone operator-type headset, hubs has a gizmo that looks just like an old-fashioned phone receiver that makes him happy–cell only works out great. And you never have to worry about checking phone messages when you get home. Hubs’ cell phone is a perk of his job, so we use mine as our “official” home telephone number. Besides, I’m more likely to A) answer, and B) be the person that someone calling our home phone number needs to speak to anyhow. Our kids are still little, and we homeschool, so I don’t see them having a need for a phone for a long time yet. Long story short: True landlines generally don’t black out during a power interruption or if your internet goes down. Cell phone providers and internet providers will tell you how rare it is to be without signal… *ahem* BS… During a tornado a month ago, a power outage knocked out the nearest cell phone tower AND internet signal. Even though the modem has a battery backup there was nothing coming into the house. I don’t know if cell phone or internet providers are more reliable in Michigan than they are in Iowa, but there really are times I wish we had a true landline, the kind that always has a dial tone.